Was there ever a time that Thomas Cromwell, lord privy seal of England in the reign of Henry VIII, was not front and center in the culture? First it was the novels. Hilary Mantel’s Wolf Hall and Bring Up the Bodies, about the tumultuous career of the Tudor power player, each won a Booker Prize. Second came the theatrical adaptation, which was a tremendous success on the London stage. Third is the six-part television series, starring Mark Rylance and Damien Lewis, which premieres on PBS on Sunday, April 6th. Just three days later, Wolf Hall: Parts 1 & 2, opens at the Winter Garden Theater on Broadway. The two parts can be seen separately or in sequence, adding up to five and a half hours. Ben Miles, who played Thomas Cromwell in London and traveled with it to New York, has a strong resume, featuring such parts as Patrick Maitland in the British series Coupling. 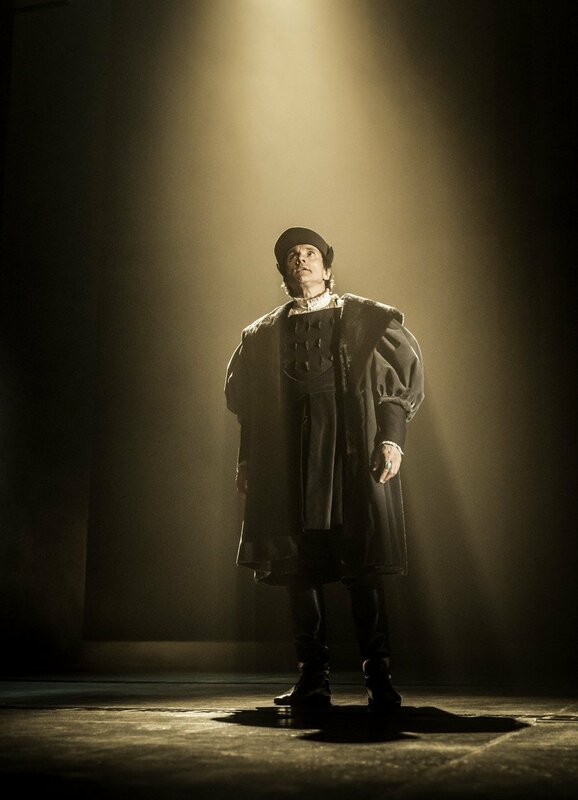 Still, the starring role of Thomas Cromwell in the Jeremy Herrin-directed play is a breakthrough for the 47-year-old. Miles has clearly given a great deal of thought to what made Thomas Cromwell tick, and he shares it in this interview. Q: A newspaper columnist in England celebrated Wolf Hall, the play and the television series, as a return to political drama. Would you agree with that? A: In part. It’s a play about political events, sure, but you really see the people who make those decisions and why they make them, the personal turmoil and the chaos that surrounds these monumental decisions that were made. The choices that people make in the play, the decisions they make, the corners that are turned, historically speaking had huge influence on the way we live now in the UK, and in Europe. And I think in the U.S. people will see parallels to today as well. It’s a great story of power and of personal ambition. You see these plays and you see first-hand the origins of so many of the constitutions of England, the religious framework of England, the sense of “royal-ism.” So many things that we live in and with now today were forged if you like during the time frame that Hilary set the plays in. And I think in the U.S. people will see parallels as well, it’s a great story of politics and power and of personal ambition. It’s very relevant. It’s not just a historical play about the Tudors, full of fancy costumes and great music. It has all of that but it’s extremely contemporary and delves into the consequences of decisions, the pressures people are under, often the chaotic nature of politics and government. It’s always easy to think that political decisions, constitutional things, are made over a period of years and they’re very sure, definite decisions, but often things are made up in the spur of the moment and they’re made for reasons that are perhaps not easy to see the true motives behind. Q: And you could make the argument that it was because of Cromwell that England became Protestant, and then the Puritans sprang up and some of them left to come…here. A: Yes, the events in this play have such tangible consequences, for us and for your country, in those religious splits. The right to religious assembly, the right to free speech, a lot of those ideas were being formed in a very early way in England and in Europe in the 16th century. Also if Cromwell hadn’t managed to get Anne Boleyn to be queen, we wouldn’t have had Queen Elizabeth, we wouldn’t have had that movement. It’s endless, the links you can make. Q: What is at the core of Wolf Hall? A: These plays are about Thomas Cromwell trying to manage ones man’s will—that is to say, Henry VIII, trying to manage a very volatile, unpredictable and incredibly powerful individual and also to steer the individual in such a way will enable Cromwell to better himself, better his peers, better his family, better his beliefs, to radically change the way the country operated in that century. A: That’s brilliant. I love that. He must have pissed Chapuys off that day. Q: It seems that Cromwell was a Machiavellian minister. What is it like to play someone that cunning? A: Oh, it’s fun. I’m still inquiring as to his motives. I couldn’t give you a definitive answer as to why he does certain things. He is an enigma. Hilary has said he is a historian’s nightmare and a novelist’s dream. What she’s managed to do is to fill in the gaps in a very creative way. But he is essentially a survivor. He is a man who took great knocks as a youth and was born into an underprivileged section of society, disappeared into Europe and reinvented himself and then returned. He’s self-taught; he’s a self-made man. You could argue he’s kind of the American dream in a way. He pulled himself up by his bootstraps, educated himself. Gained skill and notoriety. If you wanted anything to be fixed, he knew how to do it. He knew how to talk to ambassadors, he knew how to talk to gunsmiths. He knew how to put the fright into someone in a back alley as well. He was the go-to guy. Q. The Mantel novels are written in the first person and so we are inside the head of Thomas Cromwell. But in the play there are other people on the stage, including two of the most famous lovers of the past millennia, Henry VIII and Anne Boleyn. How do you help the audience get into the head of an enigma taking into account that this is not a reading experience, it’s a theatrical experience. A. It’s a challenge. It’s an odd position to be in as a lead actor. I am a protagonist, I cause things to happen, but I am also a witness at the same time for the audience. I am also driving the events onstage as well. The audience is with me, they are going along with me, but they are often surprised by what I do. Which is a great line to tread, it’s exciting every night. A: That was one of his great skills, to survive in that environment. Everyone was unsure in that world, in that Tudor court. At any moment, you could be taken out and your head cut off at the whim of the king or the reigning queen. It was particularly dangerous for Cromwell. He had few good friends he could trust. One eye was always over his shoulder. He also had a great skill: He could read people at a glance. He could tell in a second what school you went to, where you buy your clothes, what food you ate, what your vocabulary was. And then he could use the correct language to converse with that person. He was a great keeper of knowledge. But it was dangerous—a high stress life for sure. Q: I have a theory that Americans most like to watch British productions that are tackling the question of class. That’s really what Downton Abbey is about. And I’m not sure Wolf Hall would be as popular if its protagonist wasn’t from humble beginnings. A: It wouldn’t be half as compelling. That’s one of the main threads of the story. A man from nowhere, this piece of dirt, is overstepping and overtaking the most influential lords, the oldest aristocratic families in the land. The king’s right hand man. Cardinal Wolsey rose up through the ranks of the church, which was the only way it was impossible if you weren’t born into the right family. So Cromwell was unique. He was the first working class hero. Q: Hilary Mantel’s second book ends with Cromwell at his height. But several years from that time, Cromwell will fall and be horribly executed. Does that ever enter your mind in the scenes with Henry VIII, that this person will turn on him? A: You have to play it in the moment, as if the scenes are in the present. We want the audience to feel as if it’s happening right there, to forget about the characters’ lives beyond the play. In order to do that, we actors have to play it in the moment. To have any historical foresight isn’t useful to us. Q: Anne Boleyn is a woman who has obsessed people for five centuries. Cromwell brought her down. What do you believe in your heart he really thought about the queen? A: It’s very complex. Their relationship changes throughout the play. In part he admires her; they are similar people in that they are climbers. She’s a bit of an intruder and she’s certainly on the make when she comes from the French court back to England. She has her eye on the highest prize absolutely. He recognizes that in her, and at the same time she has religious ideas that are similar to his, so she is useful to Cromwell in many ways. But she becomes a liability once she gets that power, and Henry tires of her, and Cromwell’s main task is to get rid of her. At that point I think Cromwell puts his feelings for her aside, and he thinks of her in terms of how best can I bring about her downfall. He disregards the truth when it comes to her trial and the executions; he’s concerned with practicalities. He can have a heart of stone at times. You wouldn’t want to cross him. Q. I know you’ve acted in period drama before this and done quite a bit of theater. But have you ever performed on stage for such long periods? A: No! It’s crazy. I’m on stage for three hours for each show. I think I have a scene and a half off for Wolf Hall and 30 seconds off for Bring Up the Bodies. Q: That’s incredible. How do you do it? A. It’s a bit more like sport than art. I have to eat well and I work out and I try to be sensible. I do have to stay physically fit for this show. If you don’t, it can wear you down. But it’s such a great challenge and it’s invigorating, it really is. Enlivening. Q: My last question: Have you thought about what Thomas Cromwell would make of New York City? A: He would have loved it; he would have been mayor in a month. It’s his kind of town.